Jiang, J., Emont, M. P., Jun, H., Qiao, X., Liao, J., Kim, D. I., & Wu, J.
Cinnamon is a widely popular spice, with a unique flavor and aroma; however, it has long been used for medicinal purposes, mainly due to its ability to lower blood sugar and aid with digestion. One of the compounds responsible for cinnamon health benefits is cinnamaldehyde, a naturally occurring substance that not only gives cinnamon its mildly sweet flavor and aromatic scent, but it is also able to kill harmful bacteria and fungi. 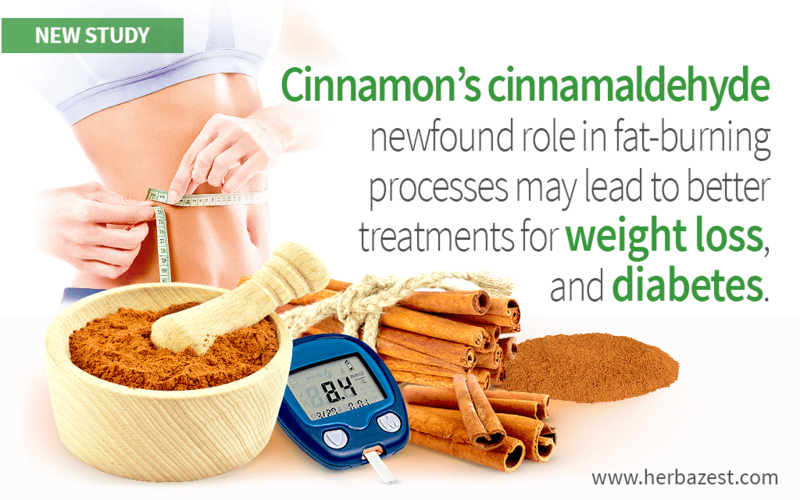 However, a new study has shed light on cinnamon's role in fat burning and, thus, regulating blood glucose levels as well as treating obesity. Adipocytes are cells primarily meant to store energy in the form of fat, which has been a highly effective mechanism for humans and many other species to thrive, allowing them to survive in times of scarcity or in cold temperatures. However, in modern times, due to a variety of evolutionary and cultural factors, this life-saving genetic treat has become a problem for a large portion of the human population, and the scientific quest for understanding and speeding-up fat-burning processes has been going on for decades. Based on a previous study, which showed that cinnamaldehyde can reduce blood glucose levels and speed-up fat metabolism, an in vitro analysis was carried out by a team of scientists, led by Jun Wu, research assistant professor at the Life Sciences Institute (University of Michigan), with the aim of further understanding the mechanisms of action behind these health benefits. The response of samples of both mice and human adipocytes exposed to cinnamaldehyde was measured in terms of heat generation, or thermogenesis, as well as synthesis and degradation of fatty acids, also known as lipid metabolism. Human adipocytes, from multiple donors of different ethnicities and ages, and with a variety of body mass indexes (BMI), were analyzed separately and the results of both samples were compared, in order to establish similarities and differences. The analysis showed that protein kinase cAMP-dependent (PKA), which plays a key role in cell metabolism, was successfully activated by cinnamaldehyde, as well as the expression levels of thermogenic genes, responsible for “burning” fatty acids. In addition, when the enzymatic reaction of a protein called fibroblast growth factor 21 (FGF21), previously shown to reduce adipose tissue inflammation and improve systemic insulin sensitivity, was inhibited, the thermogenic response of both types of adipocytes (mice and human) to chronic cinnamaldehyde treatment was partially repressed, revealing a key interaction between this cinnamon-derived organic compound and other substances involved in cellular metabolism. Both acute and chronic effects of cinnamaldehyde were detected in human adipocytes, in levels highly similar to the ones observed in mice adipose cells. By revealing the ways in which cinnamaldehyde influences cellular processes, in order to increase thermogenesis and speed-up lipid metabolism, researchers have gained a better understanding of this medicinal compound and cinnamon's potential for treating hyperglycemia and obesity. Though further research is necessary to corroborate these findings, the conclusions of this in vitro study are a decisive starting point, which may lead to novel applications of cinnamon's cinnamaldehyde in the treatment of metabolic disorders, including obesity and diabetes. Other herbs with hypoglycemic properties are goldenberries, lucuma, and yacon.